Let’s start with the line-up. Sara Holoubek, a consultant, columnist and member of the SEMPO Board of Directors is moderating. Speaking is: Bryan Eisenberg, SES Advisory Board member and co-founder of Future Now, Inc.; Jason Ciment, co-founder of LaDezign.com; Bob Myhal, president of MuscleMaster; and Kevin Lee, co-founder and executive chairman of Didit. This session is part of the Search and the Fear Economy track. The alternate title is “Hanging In There”. Sara kicks things off with the speakers telling the audience what they were doing in 1999 — when the bubble burst. Bryan was focusing on conversions, but no one was paying attention. Jason says that his conversions weren’t great back then. Bob says that he was doing everything from building the site to packing the boxes for shipping. Kevin says he was in the process of transitioning from a notorious cloaking SEO shop to paid search and paid inclusion. Sara says that they’re going to take a broad approach to how they survived back then and how it applies now. Bryan jumps in and says that in 2000 he went to a tech convention and met a guy who had been through many ups and downs, but in the biotech industry. He says that during the depression, people who put the pedal to the metal in hard times really see their competitors fall by the wayside. Bob agrees and says he’s seen this now and saw it in 1999. He says his company never had the luxury of funding, but that made them face the challenge with toughness. One of the things he was able to do then and now was acquire competitors for short money. They have grown at an average of 70 percent then and now in about two years. Jason says that when he started MagMall there were competitors that were blowing lots of money — companies were overspending with plans to make it up in lifetime value. Instead you should be showing results very quickly, not in a year or two. Kevin says the business eco-system is always Darwinian — survival of the fittest. He’s restructured Didit 10 times in the last 13 years. He’s constantly thinking of new avenues and what’s going to be strong at the end of the year. Every time you transform your company, your competitive set changes too. Jason says that the defining characteristic that separates your company from competitors is customer service. Bob says that as online marketers we spend a lot of our time trolling for new customers, but the most valuable source of revenue is existing customers. He’s gotten more innovative with ways of reaching out to existing customers. Mine the data to establish good relationships. Bryan agrees and says that real success comes from constant execution — don’t set it and leave it. Continually measure and prove. Sara says that along with the cautious consumer, the economy is hurt by the broken credit system. Jason says that his funding was always “in the mail.” The strategy that worked was always communicating with clients and targeting niches. Dominating a niche is great because social networking allows happy customers to promote your services. Sara recognizes that she’s hearing a lot of business basics. Has anything changed radically? Bryan says the fundamentals don’t change. But look at basketball in the ’70s and now. The dunk has come a long way and is a bigger part of the game, but it was always there. New tools have come out and new uses to use old tools have emerged. Now there’s almost too much data and people almost don’t know how to act on it. But it will be interesting to see if companies will invest resources into using new tools. Kevin says the biggest shift has been speed. The fundamentals are the same but everything has to be done quicker. Bob says that the numbers have changed because more marketing budgets are going online and they are more ruthless in cutting poorly performing channels. Jason says there are now new ways of listening to customers, such as Twitter. Bryan asks how many people have an active program for measuring conversions month after month. A handful raises their hands. If you’re not doing it, you need a smack to your head. Tweaking should happen constantly. Are you incorporating competitors into your site or as separate sites? Bob: They are run separately. We determined early on that site A may not appeal to one segment and site B might not appeal to another. It creates challenges and when he dreams at night, he dreams of one site, but he doesn’t see it as an immediate reality. The Web is so diffuse and there are so many things going on that you really need to target. Sara: Were they coming to you or were you going to them? Bob: It was half and half. When word got out we were in acquisition mode, we got some interested parties reaching out to us. How do you use blogs and how does it help your bottom line over all? Bryan: He built a business out of content back during the first wave. It snowballed into writing for ClickZ, several books, etc. Content writing has built a multi-million dollar business. The hard part is that people still have to catch up with how content dissemination has shifted. Kevin: If you’re going to have a content-rich strategy, know why you’re doing it. Verbal diarrhea is not usually useful. Make sure there’s a strategy behind your content, especially if you’re not a publisher. It’s all a means to an end. Do you ever have problems with running multiple sites? Bob: There is cross-over between sites. Some customers are familiar with the fact that a few sites are done by the same company. It mostly comes down to price shopping. Early on they were able to have the best content, but eventually everyone got on the content boat and the competition was too great. Instead they had to rely on offering the best products. Does a content-rich strategy work for an e-commerce store, considering the competition and the difficulty of tracking ROI? Bob: It hasn’t worked for us the way it used to. The Web became so efficient at people finding the right price that it became difficult for them to spend a lot of their time focused on generating content — and it was very difficult to track. Now they focus on bringing in people ready to buy, people who aren’t researching. Since Google is still trying to reward good content, but you want good customers, is there a disconnect between what the search engine thinks is important and what the customer really wants? Kevin: AdWords has become the last good location for marketers targeting the ready-to-buy market. Jason: TALLA — target customers within a niche; be authoritative; leverage users; leverage affiliates. Do you use product reviews and is affiliate marketing helping drive sales? Bob: Product reviews have grown in importance. Affiliates are great sources for casting a broader net and bringing people in. But affiliate marketing has substantial negatives (especially for ROI). 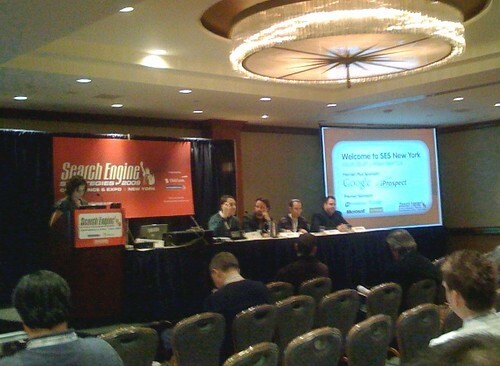 Jason: Affiliates can focus on different segments of universal search and improve your visibility. Can you follow up on your comment about the negatives of affiliates? Bob: There’s clearly a sense of competition where you’re competing against your affiliates for sales. The other tricky thing is to get a true ROI, do you just count the last click? Who gets credit when a user finds you on an affiliate and goes to Google and clicks on your ad? That’s all of the Q&A I’m going to cover. Time for lunch!